For culture-loving idealists who believe that art and design have the power to transform society, not just decorate living-room walls, Newfoundland’s Fogo Island Inn is a symbol of hope. Retired tech executive Zita Cobb – a dot.com millionaire who was raised on the island but left at 16 when her father’s fishing job vanished – started the hotel as a means of reviving Fogo’s depressed economy. This was accomplished in part by encouraging tourists to visit the rocky outcrop, which is Newfoundland’s largest offshore island, and also by hiring locals to build and maintain the 29-room structure, and encouraging international filmmakers, artists and writers to visit and spark cross-cultural collaborations. Although the inn, designed by Newfoundland-born, Norwegian-based architect Todd Saunders, only opened in June 2013, it has already created an impressive output, including a line of furniture designed by both Canadian and European designers (Quebec’s Elaine Fortin and England’s Donna Wilson) and made by local craftspeople. 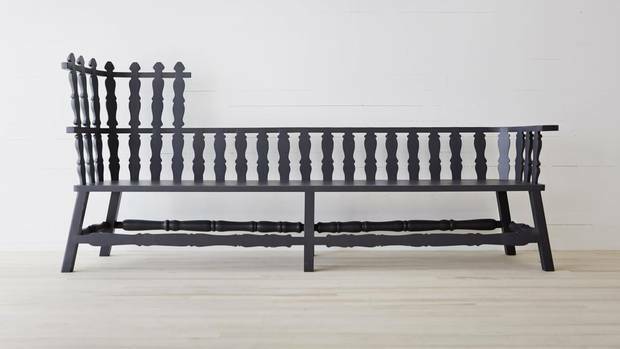 The Long Bench, by the Netherlands’ Ineke Hans, is particularly spectacular. Its simple spindle back speaks to the traditional aesthetic of the place – spare, unfussy and tough, in the best ways possible. Price upon request. Through klausn.com. This piece originally appeared in the Globe and Mail on Thursday, October 16, 2014.